CLASSIC Take a Guided Walking Tour of Lima to see the colonial Old Quarter, Plaza de Armas, the presidential Government Palace, and the Lima Cathedral. Visit San Francisco Monastery to see the famous catacombs followed by the Larco Herrera Museum—with the world’s largest private collection of pre-Columbian Peruvian art. CLASSIC Fly to Cusco, the ancient Andean city and former capital of the Inca Empire. A Guided Excursion into the Sacred Valley reveals the hillside Temple of Sacsayhuaman. Marvel at the remarkable inca stonework of this 15th-century fortress that was once the site of the largest battle between the Incas and the Spanish. The Spanish were ultimately victorious in 1536, disassembling part of the site to build homes in Cusco and leaving behind the ruins we find today. You will also see the Inca military post of Puca Pucara and visit the ceremonial site of Kenko where ancient Peruvian rituals and sacrifices were performed. DISCOVERY Take a Guided Tour of Awanakancha to encounter llamas, alpacas, vicuñas, and guanacos and learn about their vital role in Peruvian culture. Continue to the old mountain village of Pisac. Take time to shop in Pisac’s large Indian market for treasures such as alpaca sweaters, woven blankets, and handmade jewelry. CLASSIC Join a Guided Tour of the adobe village of Ollantaytambo this morning to visit the ruins of an Inca fortress. See the massive stones and amazing engineering design, including the Sun Temple and Princess Baths fountain. DISCOVERY Join an Escorted Visit to a native Incan home to experience the way of life that has endured since the 13th century. CLASSIC Join a Guided Excursion aboard the 360° Machu Picchu Train boasting spectacular panoramic views of the lush countryside of Urubamba Valley from its panoramic windows and an observation outdoor carriage. Travel by rail to Aguas Calientes to take the winding road to legendary Machu Picchu. ACTIVE Take a Guided Walk to explore the “Lost City of the Incas” high atop the Andes once overlaid with dense forest. Learn about the lives and mysteries still hidden in this ancient citadel and the amazing structures built by the pre-Columbian masters of this sacred land. CLASSIC Take a second included Guided Excursion to Machu Picchu. Set out early to see the sunrise over the ruins, explore the terraces or perhaps venture up to see the Sun Gate, once used as the ancient entrance to the Sanctuary. CLASSIC Take a Guided Walking Tour of Cusco and learn about the Inca culture and the Spanish invasion that threatened their way of life and very existence. Visit Santo Domingo Monastery, originally called Koricancha and built by the Incas as a Temple of the Sun with extraordinary engineering and masonry design. Continue to the Plaza de Armas to visit the Cusco Cathedral. CLASSIC Today, you’ll travel by air to Lima and then onto Iquitos where you take a Guided Orientation of this 19th-century boom town with ornate homes built by the “rubber barons” of the day, such as La Casa de Fierro (The Iron House) designed by architect Gustave Eiffel. DISCOVERY Attend an onboard Welcome Reception to gain an overview of your upcoming Amazon experience. Your Naturalist Guide will offer information about the animal species of the Amazon ecosystem, the native villagers you’ll meet, and the spectacular plant life that thrives in this astonishing environment. See the two powerful Amazon tributaries—the Ucayali and Marañon Rivers—which converge to create the mighty Peruvian Amazon. CLASSIC Rise early this morning for your first glimpse of the majestic Amazon at sunrise to experience the sights and sounds. After breakfast, take a Guided Panga Ride down one of the Amazon’s tributaries in search of the incredible wildlife. Your Naturalist Guide helps to spot capuchin, howler, tamarin, and spider monkeys, as well as iguanas, sloths, freshwater pink dolphins, and a stunning array of birdlife. Watch for the extraordinary giant Amazonian water lily. CLASSIC This afternoon, a Guided Excursion to Pacaya Samiria National Reserve allows you to witness the activity of exotic birds, including trogons, macaws, parrots, falcons, and jacamars. ACTIVE Take a refreshing Swim in this unique area of the Amazon—with the chance to encounter the Amazon’s amazing pink dolphins. ACTIVE Join a morning Naturalist Guided Walk to explore tropical flora, including epiphytes, orchids, and indigenous jungle vegetation below the rainforest’s canopy. DISCOVERY Attend an onboard Nature Presentation about indigenous and medicinal plants, fruits, and vegetation used in the Amazonian culture for centuries. CLASSIC This afternoon, a Guided Excursion to the Amazon community of San Francisco introduces you local villagers who have called Amazonia their home for generations. ACTIVE Join a Night Safari Excursion to spot nocturnal creatures, including caiman, frogs, bats, and boa constrictors. You will also have the chance to try fishing for piranhas! CLASSIC Take a Guided Sightseeing Tour of Quito that showcases the colonial city’s historic sites, including the impressive Legislative Palace with its enormous sculpted mural of Ecuadorean history. You’ll also see Independence Plaza and visit the 16th-century San Francisco Monastery, and La Compañía Church—the exquisite Jesuit cathedral with its spectacular Spanish baroque architecture—more than 160 years in the making. DISCOVERY Take a Guided Walk down Calle La Ronda—one of Quito’s oldest streets—with a wealth of artist’s workshops and galleries where you’ll meet local artists and learn about their original works. Later, visit a local chocolate factory for a tour and a tasting to discover why Ecuador is one of the world’s finest chocolate producers. CLASSIC Your day in Quito ends with a Guided Excursion to the Ciudad Mitad del Mundo—a monument to the Equator—the “middle of the world.” Stand in both the Northern and Southern Hemispheres at the same time at the exact location of the Earth’s Equator. Observe the equatorial effects of the dual-spiraling directions of water and balancing eggs on end. DISCOVERY Join your naturalist on a Guided Excursion to Santa Cruz Island to visit the Charles Darwin Research Station— established to help conserve the Galápagos’ natural habitat and protect the famous giant tortoises. While here, learn about the tortoise-rearing program and see many of the various islands’ tortoises. DISCOVERY This morning, you will find yourself anchored in the western-central part of the archipelago where volcanoes are still active, attributing to the dramatic scenery. Take a Naturalist Led Excursion of Sullivan Bay on Santiago Island where you will walk on newly-formed (less than 100 years ago) lava flows reminiscent of the lunar landscape. You can catch sight of lava lizards, marine iguanas, Sally Lightfoot crabs, and even the Galápagos penguin. CLASSIC Take a Naturalist-Led Excursion to see colonies of remarkable bird species, including blue-footed boobies, great frigate birds, and magnificent frigate birds—with its inflated red chest and nearly 7-foot wingspread. Watch for gulls and herons of all assortments. ACTIVE Take a Guided Snorkeling Excursion in the aqua blue waters just off North Seymour Island’s shore—teeming with sea lions and amphibious marine iguanas—found only in the Galápagos. DISCOVERY This morning, take a Naturalist-Led Excursion to South Plaza Island to observe wildlife, including sea lions, land iguanas, marine iguanas, and hybrid iguanas (only found on this island and a result of a cross between land and marine iguanas). You will see blue-footed boobies, Nazca boobies, frigate birds, swallow-tailed gulls, Audubon’s shearwaters, and many other species. DISCOVERY This morning, cruise to Puerto Baquerizo Moreno for a Naturalist Guided Tour of the San Cristobal Interpretation Center. You’ll learn about the Galápagos’ fascinating volcanic origins, remote location, climate, and the arrival of diverse species that inspire both imagination and science. Maximum elevation on tour: 11,200 ft. Participation in this vacation requires purchase of the following flights from Avalon Waterways, not included in pricing: (1) roundtrip air from your U.S. gateway, starting at $2,103 (based on Miami, departure in January, 2019) and intra-vacation air segments; or (2) intra-vacation air segments only. Required intra-vacation air segments are: Lima/Cusco; Cusco/Iquitos; Iquitos/Lima; Lima/Quito; Quito/Galápagos; Galápagos/Quito. Air prices were effective on February 7, 2018, and their availability is limited. At the time you purchase your tour, air prices may be higher. 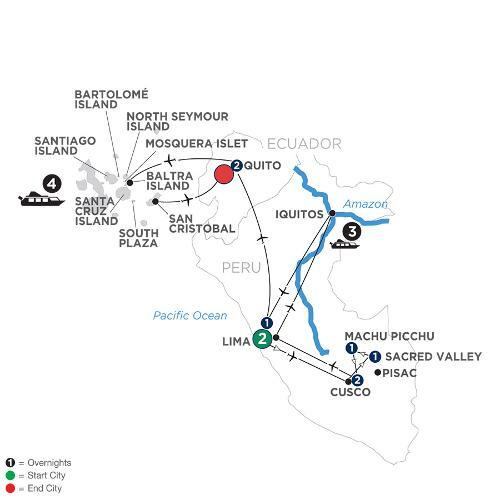 Land/Cruise price includes the Galápagos National Park entrance fee and transit card ($120 value). Gratuities to Local Guides & drivers are included. All prices are per person based on double room occupancy. Prices shown above include cruise in a Suite. Upgrades to Upper, Corner, or Owner’s Suites are available. 2020 prices and itineraries are subject to change.